One weekend a bunch of summers ago, when I was single, young, and optimistic, it was so hot that the young adults of New York City were walking around in their underwear. Shirtless men in micro shorts and sandals and women in the tiniest of skirts and what really was a nightie dressed up as outerwear but no less transparent. It was an excellent time to roam the streets, no imagination needed. One day my friend from France, I'll call him "Luc", dropped by wearing a beat up t-shirt, jeans with their legs torn off at the hip, and sandals. "Luc" I said, "What happened? I know it's hot but you look like the cat dragged you in through a junkyard". "I know", he said smiling from ear to ear "In Paris I could never leave the house like this". Americans, are, as a group, the most casual dressers in the first world. Now this isn't a bad thing, we have a porous, egalitarian society but woe to the sales person who judges a customer on how they dress. But, and this very important. The reverse isn't true. If you are selling high end woodworking products, as a cabinetmaker or as anything, customers will judge you all the time. It's about first impressions. You might have just gotten out of the workshop (which destroys clothing) and you might be the honest workman but the first impression your customer will have is a guy wearing beat up clothing who obviously doesn't identify with the high end, well made, products you makes. No matter how convincing your sales patter is, you are not advertising your product very well because your subliminal message is defeating your pitch. It becomes an uphill battle. This is why if you going into any high end store the sales staff is dressed to the nines. Of course with woodworking products, you have to be careful. If you show up to a meeting in a suit and tie you are breaking the connection the customers want to have with the "maker", with the "craftsman". Even if you happen to be the person making the stuff, you come off as a sales guy and lose your maker cred. Most guys I know who work with clients make sure that when they deal with clients directly they aren't wearing their shop clothing, but are wearing clean and stylish versions of their shop clothing. You need clothing that is clean, fits, informal but respectful, and most of all is well made and looks it. Clothing has to be stylish enough so that people don't think that you and your work are old fashioned. Do it right and the client who has no professed interest in clothing will still get a subconscious message that you are doing good work, and the client who actually takes an interest in clothing will get additional message that you are well dressed, clean and neat, and your clothing has the details and quality that they are looking for in furniture. You want your clothing to advertise that you are a person who understands quality and that your bid, while on the high side of your competitors (of course), reflects your plan to deliver exactly the quality product they are looking for because you understand exactly what the customer is looking for. Before you yell at me and tell me I'm exaggerating, think about how hard it is to convince anyone what quality is and why they should pay you for it, and then think about how we can all use any help we can get in moving a deal to close. Even if clothing isn't something you are naturally interested in - and I'm certainly not interested in clothing - it doesn't mean you can't be better at it. Fortunately, unlike learning to play the banjo, dressing better is mostly about finding sources for well made clothing, and making sure it fits. This is a lesson I learned late in life. Preparing a presentation is just one more part of a project, and the accessories, including clothing, to make the presentation go well are just the cost of doing business. I think of it as a presentation tool like any other. This gives me an excellent opportunity to mention that we are now stocking in very limited quantities a few styles of work clothing by "Engineered Garments". EG clothing is all made in a 50 mile radius of New York city, and the quality comes from using top notch fabrics and extreme attention to detail. We are stocking their clothing because EG the brand is owned by Nepetheles, a NYC garment firm that invited us last January to have a pop-up store in their store, and we were so take by the quality of the stuff they make, we thought we would give it a try. I have personally bought two pairs of pants and for the first time in my life I'm getting a few compliments because the pants are properly tailored in the first place and they just fit me better. We elected to work with Engineered Garments, which is one of the best makers of work clothing in the US but happens to be at the high end of quality and price. Look around, ask around, if you want to up your game find a clothing maker who speaks both to how you want to be presented and to your budget. You will find that you will walk into a sales meeting with more confidence, you will create a better impression, and both advantages will make it easier to close a deal. Note: Unlike everything else we sell we are not allowed to offer EG clothing via a click to purchase on-line. if you see something you like, just give us a call (800-426-4613) and we will help you with sizing and placing the order. You hit the nail pretty much on the head. In my world (well, really my 'ex-world' since I am now retired) of design engineering, dressing well was important. In my world of engineering where you had to interact with clients - well, dressing well became very important. None of this was apparent to me in my younger days but it certainly sunk in when I got older. I appreciate well made, durable clothing such as EG's, however such clothing can be purchased for much less. One must always be aware of our own personal economy and not follow the trends of fashion. If I could afford to purchase these items I would. Those prices are out of line with much of rural America where your wood is coming from and where a good percentage of fine wood craft is produced. We all have noticed the decline in quality and durability and increase in price of the softened blue jeans. Blue jeans of old would take nine months to break in now are beginning to fray at the same age. I just read your piece on your new line of Engineered Garments. As someone who is a self-confessed "clothes hound" and takes pride in how I dress, I do see the uniqueness of the product, fully understand the impact good clothing makes, understand that good quality seldom costs more in the long run, and have learned by experience the value of first impressions. But come on, $170 for a work shirt! Yes it has some good unique features but it does not cost the price differential to make it longer, add pockets, and make it roomier. This is the weakness your type of business (higher price retail outlets) is going to have to wage war with. You are being hit by the influences of "made in chinaâ", internet commerce, free or very low cost shipping, and outdated concepts in your mark-ups. The old days of retailers like Sears selling items at traditional retail mark-ups and today business of highly inflating pricing so you can offer a "bargain sale price" is reality. The rub comes when your type of business sells items at high mark-ups, charge for freight to us, and the only service is that you sell the items to us. Your outdated mark-up strategies are easy targets in today's Amazon world. If it cost $10 dollars to make the widget, doubles as it passes thru the manufacturer, doubles again as the item is placed into the distributing companies' inventory, and then doubles again at retail by you; we now have a retail price of $80. I have purchased many items from you in the past; but for items that were well made and most unlikely not to fail prematurely. Not for expendables like a shirt. Other items you sell like sand paper and various supplies are easily obtainable at lower prices from your competitors. I am not writing this because I am upset or angry with you but instead because I fear your demise. You are friendly folks, a pleasure to talk with on the phone, and are innovative with new products. Most of your competitors are changing the way they operate their business with free or very low freight, promotions, and more realistic mark-ups. Or maybe, you need to do some more selling on why this shirt is worth $170. So far I am not convinced. Your comments about clothing are exactly correct. I am older; mature is the word that appeals to my ego. I have enjoyed decades of business and public service employment. During my last 16 year job/calling I managed more than 250 employees in a public service agency with a $9.5 million budget. I spoke many times to high school career development classes about job searches and and interviews. One of the most important parts of developing a rapport with a prospective employer or a potential customer is dressing appropriately for the mission. Regardless of our opinions, first impressions are extremely important, even away from the work site. On even my trips to the YMCA to swim laps I am cognizant of my clothing. Our clothing, in some ways, is construed to reflect our opinion and respect for ourselves, others around us, and the institution we are visiting. Only in NYC could you find for sale a particularly ugly pair of Carhart duck work pants....for the bargain price of $170.00. To many of us craftsman at work in parts west of NYC...common sense is still a virtue, and 'Made in New York' is not the attraction it is thought to be. I've bought a few thousand dollars of tools and sharpening items from you this fall and love everything I have purchased and the customer service , but I have to say b###s#it to to this last blog post. Have a great day. I have to comment succinctly with regard to your blog post regarding clothes as I see it with the only unique point being Made In New York. That is: "are you kidding me with these prices"? Impressions are vital in business and how the client or prospective client sees you is critical. Over dress and the client may think you're wasteful. Under dress and the client may see that as a sign of an inferior product or service. I worked in the corporate world for 30 years. If the skin on your leg was revealed when crossing your legs because you weren't wearing over the calf socks, or the lines on your tie didn't match at the knot, or your hair was just a little too long or your shave not close enough...and on and on. Extreme to the extreme. If you weren't wearing the uniform you'd never get in the game. You needed to look the part and you needed to do it as though it was effortless. I showed up to go along on an inspection of a building under construction. First thing the onsite engineer did was hand me a beat-up hardhat. He said if he gave me a nice new one, no one would respect me or take my questions seriously. When we contracted out the finish on our basement a number of years ago I noticed how easy it was to put yourself in the remodeling business. Simply show up wearing a pair of straight legged dungarees (denim/jeans), work boots, a shirt with your logo embroidered, and a tape measure on your belt, you were in business. They get in the door, then they have to deliver. But, the "look" got them in. The proof of one's worth is ultimately in the finished product. But, if the client doesn't perceive you correctly you'll never get a chance to show what you can do. Spending $170 for a pair of work pants? Ridiculous. Spending $$$$ on tools - that's where the money needs to go. As always, thanks for your comments. I read them to my wife and she said she was amused that I'm now the guy with the fancy pants since I had previously been the guy who spent nothing on my wardrobe. I don't have many items of clothing and I hate shopping. I did (and obviously still do) love the idea of U.S. made, high quality products, including clothing. I certainly understand the reservations about the cost of these pants. It took seeing them and trying them on to make a believer out of me. I plan to wear the hell out of them - they look like they'll be up to the task. I should also mention that this is just our first stab into work wear. We sell a wide variety of stuff in all sorts of price ranges. For example, we stock combination gauges ranging in price from under $20 to over $500. As I said in the original blog post, there are many great US makers of work clothing. I suspect that as we figure this out we will expand our range to include other American makers with more options for everyone. 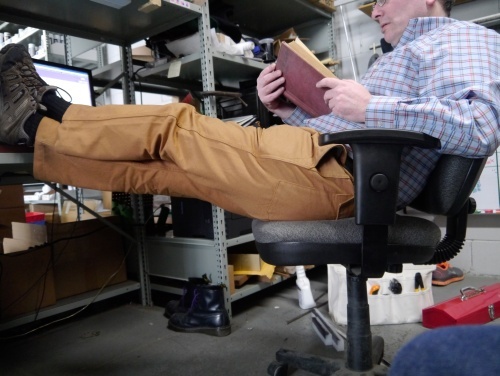 "As I said in the original blog post, there are many great US makers of work clothing. I suspect that as we figure this out we will expand our range to include other American makers with more options for everyone." Thank you.